Some of you may be wondering how this World’s first came about. Well, it was all due to Twitter. After a lot of nagging encouragement from one of my PhD students, I finally joined Twitter at the back-end of 2012. 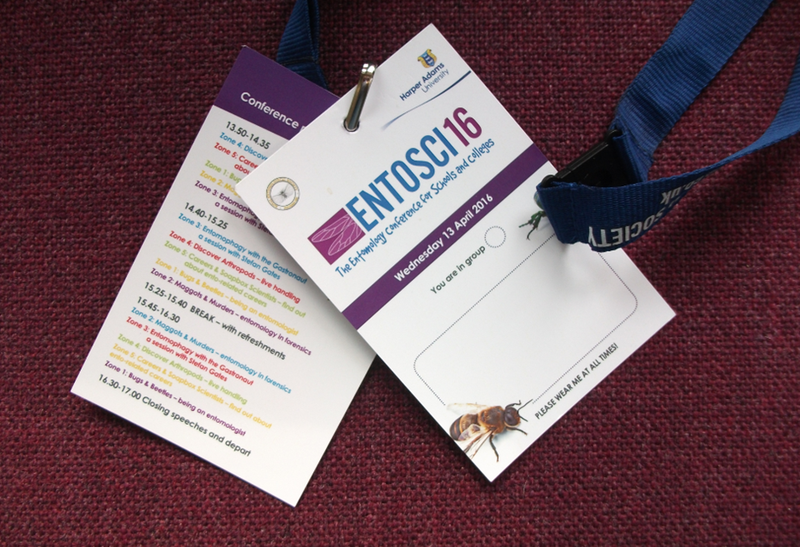 Shortly afterwards I met another new Tweeter, @Minibeastmayhem (Sally-Ann Spence in real life) who approached me with an idea that she had tried to get off the ground for a several years – an entomology conference for children. This sounded like a great idea to me and I was extremely surprised to hear that she had been told by various entomologists that it wouldn’t work. After a bit of ‘to and fro’ on Twitter we met up for a very nice Sunday lunch and hammered out a basic plan of action and a mission statement. 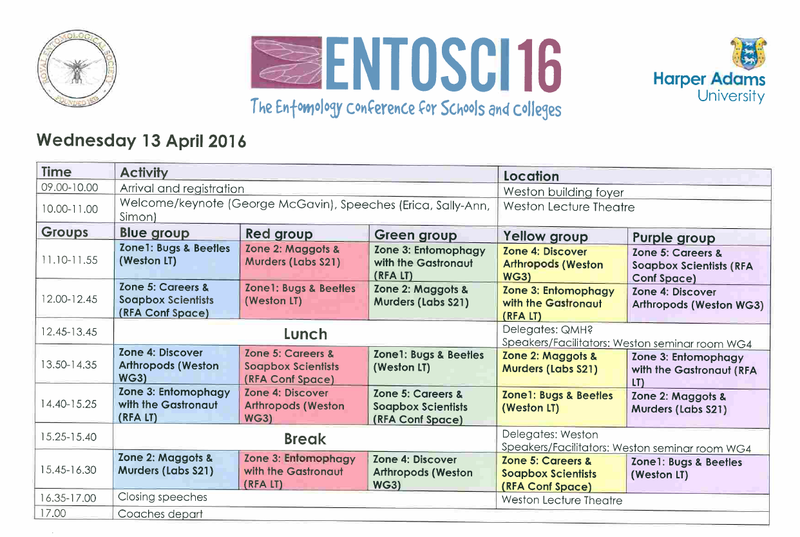 started on the action-packed, and hopefully enthralling and stimulating conference circuit. George McGavin (our Patron) and Erica McAlister from the Natural History Museum (London) got the conference off to a great start with two very entertaining plenary talks about the wonders of entomology and flies respectively. After that it was on to the zones. Graham & Janice Smith with the help of Tim Cockerill, were kept very busy with their Bugs and Beetles room, Steffan Gates (the Gastronaut) gave a dazzling and interactive display of entomophagy, Amoret Whitaker from the University of Winchester introduced the students to forensic entomology which included them processing a ‘maggot-infested crime scene’, and current and past MSc Entomology students (Soap Box Scientists), the Field Studies Council, RHS Wisley, and other exhibitors provided a very interactive and informative session in Zone 5. 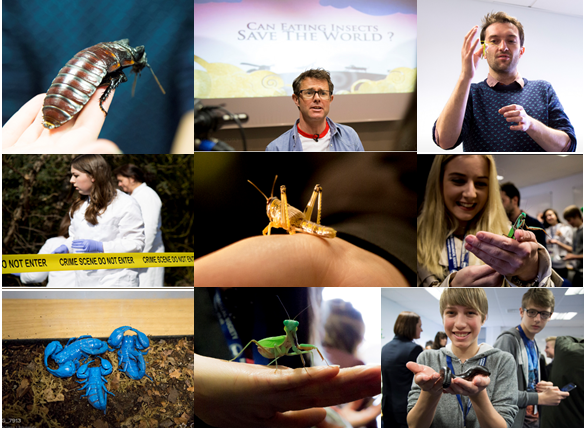 In the main lecture theatre, Max Barclay, Erica McAlister, George McGavin, Andy Salisbury, Darren Mann and Richard Comont were subjected to a barrage of questions ranging from how much they earned, to their favourite insects, their most dangerous insect encounter, some much easier to answer than others. The day was especially long for some of us, as BBC Breakfast came and did some live filming, which meant that the organisers, presenters and some hastily drafted in students had to put in an appearance at 0645. I think that they felt it was worth the effort though, if only to be able to say that they had been on TV. All in all, the day was a real buzz. Of course the real stars were the insects and other invertebrates which managed to generate real enthusiasm among the delegates and their accompanying teachers. 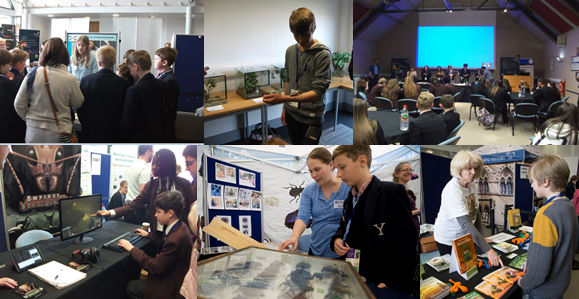 It was wonderful to see how many of the students responded so favourably to the insects, many of whom, at first, were reluctant to get close-up and personal with them. Seeing so many young people “oohing and aahing” rather than” yukking and gagging” really made my day. 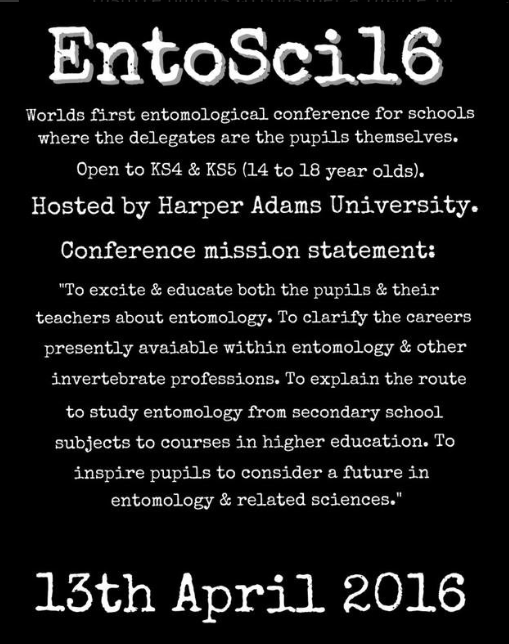 I really, truly believe, that we will be seeing many of the delegates becoming professional entomologists. I leave you with a few images to give you the flavour of the day. For more professional images this link should keep you happy. 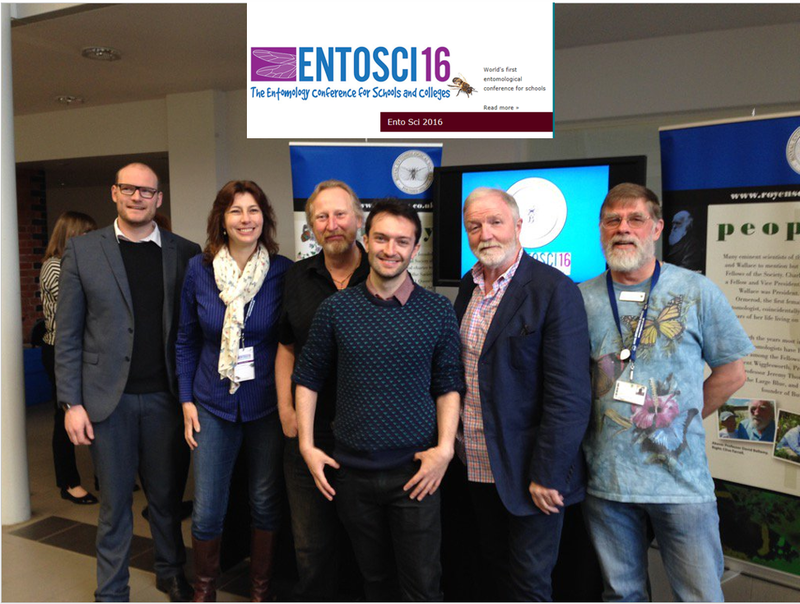 Some of the team, Luke Tilley, Sally-Ann Spence, Graham Smith, Tim Cockerill, George McGavin and me. 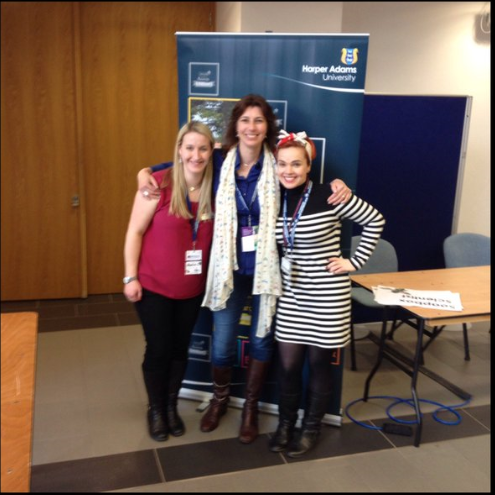 A really huge thank you to Laura Coulthard and Helen Foster, from the Harper Adams Marketing and Communications Department, who put their hearts and souls into making sure that the event ran smoothly. We couldn’t have done it without them. whilst on an expedition to Nordaustlandet* (the second largest of the Spitsbergen group and almost entirely covered by ice) reported finding large numbers of aphids, many still alive, later identified as Dilachnus piceae (now known as Cinara piceae) (Elton, 1925). Cinara piceae the Greater Black Spruce Aphid –big and beautiful. He suggested that the aphids came from the Kola Peninsula, a distance of about 800 miles (almost 1300 km) due to the strong south and south-east winds blowing at the time. He estimated that they would have made the journey within twelve to twenty-four hours. This was regarded as being an example of totally passive migration and used as one of many examples of aerial plankton** (Gislen, 1948). This is, however, probably not giving aphids credit for what they are capable of doing when it comes to flight. 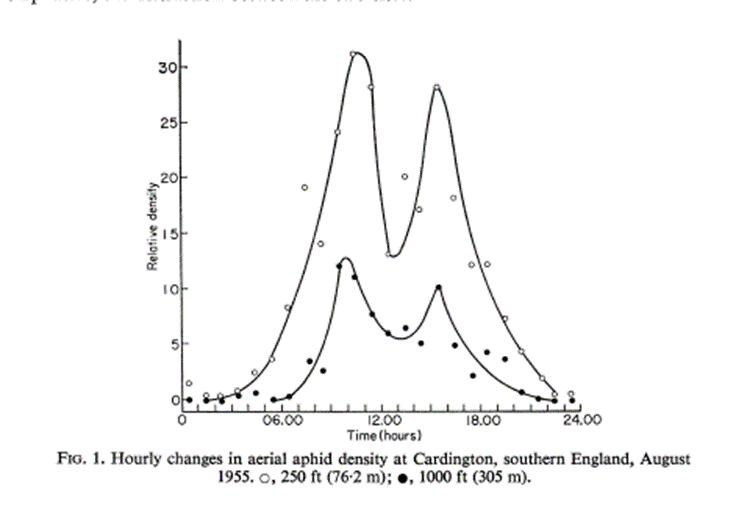 Berry & Taylor (1968), who sampled aphids at 610 m above the grounds using aeroplanes, implied that the aphids, although using jet streams, were flying rather than floating (page 718 and page 720) and that they would descend to the ground in the evening and not fly during the night. Aphids don’t usually fly during the night. (From Berry & Taylor (1968)). 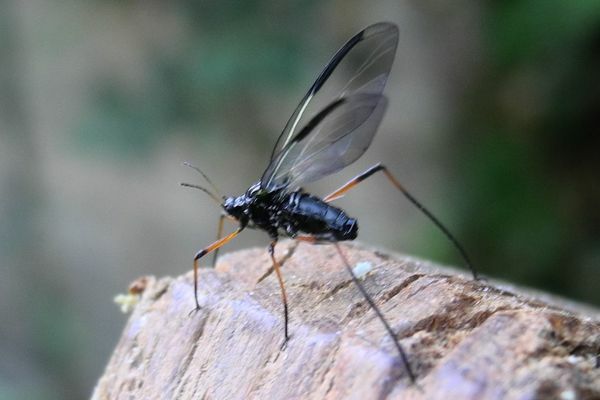 Dixon (1971) interprets this somewhat differently and suggests that the “movement of the air in which it is flying determines the direction of its flight and the distance it will travel” but then goes on to say “after flying for an hour or two aphids settle indiscriminately on plants”. So yes the speed of the air in which the aphid is flying will determine how far it flies in a set time, but as aphids can fly much longer than an hour or two, active flights of from between 7-12 hours have been recorded (Cockbain, 1961), this rather suggests that the aphids are making a “decision” to stop flying and descend from the jet stream. That said, in the words of the great C.G. Johnson “aphids are weak flyers”, they cannot make progress against headwinds of more than 2 km per hour (Johnson, 1954), although Trevor Lewis gives them slightly more power and suggests that the can navigate against winds of up to 3 km per hour (Lewis, 1964). Whatever the upper limit is, it doesn’t mean that they are powerless when it comes to ‘deciding’ when to stop flying. In the words of Hugh Loxdale and colleagues, “aphids are not passive objects” (Loxdale et al, 1993). 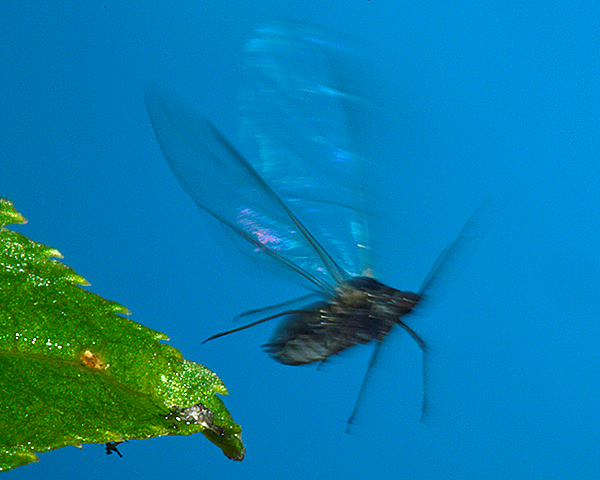 Aphidologists, were until the 1980s (Kennedy, 1986), generally somewhat sceptical about the ability of aphids to direct their flight in relation to specific host finding from the air and not just flying towards plants of the right colour (Kennedy et al., 1961), or at all after take-off (Haine, 1955). The general consensus now, is that aphids control the direction of their flight in the boundary layer*** but that it is determined by the wind at higher altitudes (Loxdale et al., 1993). Whilst we are discussing viewpoints, another point of debate is on whether aphids migrate or not. Loxdale et al., (1993) state that “migration can be viewed ecologically as population redistribution through movement, regardless of whether deliberate of uncontrolled or from the behavioural viewpoint of a persistent straightened-out movement affected by the animal’s own locomotory exertions or by its active embarkation on a vehicle”. In the case of aphids the vehicle could be the wind. 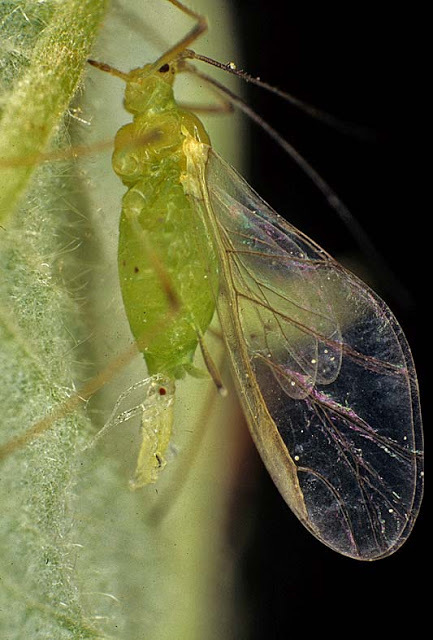 Under both definitions, aphids can be defined as undertaking migrations. Long-distance migration by aphids is defined as being greater than 20 km and short-distance (local) migration being less than this (Loxdale et al., 1993). Long-distance migration is likely to be the exception rather than the rule with most aphids making local flights and not venturing out of the boundary layer, sometimes travelling distances no more than a few hundred metres (Loxdale et al., 1993). There are different types of winged aphids (morphs) and these show different angles of take-off and rates of climb. In Aphis fabae for example, which host –alternates between spindle and bean, the gynoparae which migrate from the secondary host to the primary host, have a steeper angle of take-off and climb more rapidly than the alate exules which only disperse between the secondary host plants (David & Hardie, 1988). The gynoparae are thus much more likely to end up in the jet stream and be carried longer distances, with, of course, a greater chance of getting lost (Ward et al., 1998). The alate exules however, may only land in the next field or even in the same one, and easily find a new host plant (Loxdale et al., 1993). These differences between the morphs of host alternating aphids are also seen in the bird cherry-oat aphid Rhopalosiphum padi (Nottingham et al., 1991). Once safely air-borne, the aphids then have another set of problems to overcome. How do they ‘decide’ when to land? How do they ‘know’ that there are host plants below them? Aphids have two main senses that help them locate their host plants, vision and smell (odour recognition) (Kring, 1972; Döring, 2014). Generally speaking, aphids respond positively to what we perceive as green or yellow light and negatively to blue and red light (Döring & Chittka, 2007) although this is not an absolute rule. Some aphids are known to preferentially choose yellowing leaves (sign of previous infestation) e.g. Black Pecan Aphid Melanocallis caryaefoliae (Cottrell et al., 2009) which indicates a pretty sophisticated host finding suite of behaviours. Aphids in flight chambers will delay landing if presented with non-host odours even in the presence of a green target (Nottingham & Hardie, 1993) and conversely can be attracted to colourless water traps that have been scented with host plant odours (Chapman et al., 1981). Aphids are thus using both visual and olfactory cues to locate their host plants and to ‘decide’ when to descend from the jet stream or boundary layer (Kring, 1972; Döring, 2014). They are not merely aerial plankton, nor are they entirely at the mercy of the winds, they do not deserve to be described as passive (Reynolds & Reynolds, 2009). From air to plant – how aphids chose their host plants – after Dixon (1973). are infested with them is relatively low, about 10% in a diverse landscape (Staab et al., 2015), although in a crop, the level of infestation can approach 100% (e.g. Carter et al., 1980). The fact that in some cases less than 1% of those that set off will have found a host plant (Ward et al., 1998) is not a problem when you are a member of clone; as long as not all of the members of a clone gets lost the journey has been a success. They may be small, they may be weak flyers, but enough of them find a suitable host plant to keep the clone alive and kicking; not all aphids get lost. Carter, N., Mclean, I.F.G., Watt, A.D., & Dixon, A.F.G. (1980) Cereal aphids – a case study and review. Applied Biology, 5, 271-348. Chapman, R.F., Bernays, E.A., & Simpson, S.J. (1981) Attraction and repulsion of the aphid, Cavariella aegopodii, by plant odors. Journal of Chemical Ecology, 7, 881-888. Cockbain, A.J. (1961) Fuel utilization and duration of tethered flight in Aphis fabae Scop. Journal of Experimental Biology, 38, 163-174. David, C.T. & Hardie, J. (1988) The visual responses of free-flying summer and autumn forms of the black bean aphid, Aphis fabae, in an automated flight chamber. Physiological Entomology, 13, 277-284. Dixon, A.F.G. (1971) Migration in aphids. Science Progress, Oxford, 59, 41-53. Dixon, A.F.G. (1973) Biology of Aphids, Edward Arnold, London. Döring, T.F. & Chittka, L. (2007) Visual ecology of aphids – a classcial review on the role of colours in host finding. Arthropod-Plant Interactions, 1, 3-16. Döring, T., Hardie, J., Leather, S.R., Spaethe, J., & Chittka, L. (2008) Can aphids play football? Antenna, 32, 146-147. Döring, T. (2014) How aphids find their host plants, how they don’t. Annals of Applied Biology, 165, 3-26. Elton, C.S. 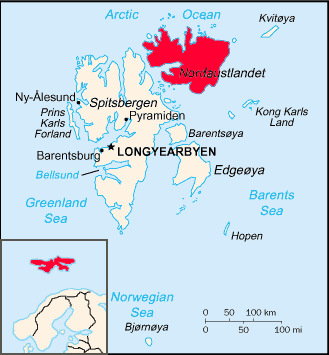 (1925) The dispersal of insects to Spitsbergen. Transactions of the Entomological Society of London, 73, 289-299. Gislen, T. (1948) Aerial plankton and its conditions of life. Biological Reviews, 23, 109-126. Johnson, C.G. (1951) The study of wind-borne insect populations in relation to terrestrial ecology, flight periodicity and the estimation of aerial populations. Science Progress, 39, 41-62. Kennedy, J. S., Booth, C. O. & Kershaw, W. J. S. (1961). Host finding by aphids in the field III Visual attraction. Annals of Applied Biology, 49, 1-21. 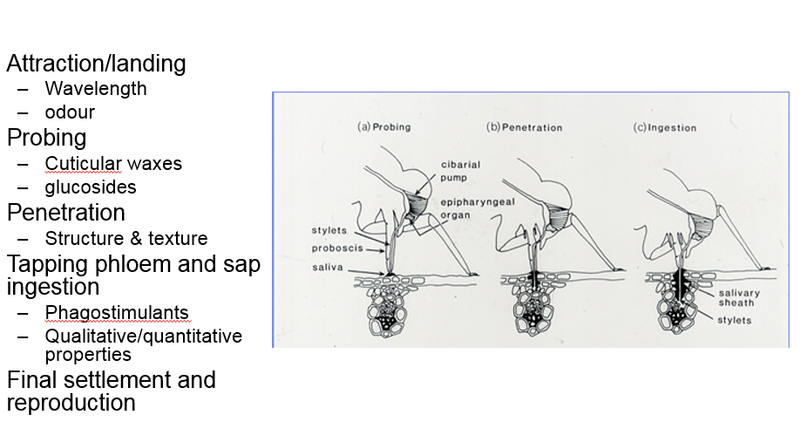 Kring, J.B. (1972) Flight behavior of aphids. Annual Review of Entomology, 17, 461-492. Loxdale, H. D., Hardie, J., Halbert, S., Foottit, R., Kidd, N. A. C. &Carter, C. I. (1993).The relative importance of short-range and long-range movement of flying aphids. Biological Reviews of the Cambridge Philosophical Society, 68, 291-312. Nottingham, S.F., Hardie, J. & Tatchell, G.M. (1991) Flight behaviour of the bird cherry aphid, Rhopalosiphum padi. Physiological Entomology, 16, 223-229. Reynolds, A.M. & Reynolds, D.R. (2009) Aphid aerial desnsity profiles are consistent with turbulent advection amplifying flight behaviours: abandoning the epithet ‘passive’. Proceedings of the Royal Society B, 276, 137-143. Staab, M., Blüthgen, N., & Klein, A.M. (2015) Tree diversity alters the structure of a tri-trophic network in a biodiversity experiment Oikos, 124, 827-834. Ward, S.A., Leather, S.R., Pickup, J., & Harrington, R. (1998) Mortality during dispersal and the cost of host-specificity in parasites: how many aphids find hosts? Journal of Animal Ecology, 67, 763-773. Political and geographic borders are not factors that deter aphid migrants, Wiktelius (1984) points out that aphids regularly make the journey across the Baltic in both directions to and from Sweden. Wiktelius, S. (1984) Long range migration of aphids into Sweden. International Journal of Biometeorology, 28, 185-200. ** Johnson (1951) objects to this terminology in no uncertain terms. That said, as there are records of non-winged aphids being caught by aircraft (Kring, 1972), it does suggest that there may be some accidental migration going on. *** The UK Met Office defines the boundary layer as “that part of the atmosphere that directly feels the effect of the earth’s surface” and goes on to say that depending on local conditions it can range in depth from a few metres to several kilometres.